Due to the unique product concept the book2net kiosk is more then a replacement technology for current copierers: book2net kiosk enables you to fit your requirements in a much better way, improve your service and reduce your costs significantly. The configurable graphic user interface gives you the opportunity to adapt the software on your individual workflow. Single functions can be easily added and up to 7 languages are available for user guidance. To meet legal requirements book2net kiosk enables you to implement copyright regulations and/or watermark as an integrated part of the workflow. Additionally it is possible to integrate a customer or sponsors logo on the graphic user interface. The new twin touch technology and remarkable short cycle time enables the unskilled walk-up operator to achieve high-quality scans quick and easy. The book2net kiosk is delivered as an out-of-the-box solution. Just plug in the power supply and start! book2net kiosk is designed for 3 million cycles and has less mechanical components. For a maximum reliability all components are highly protected and the robust construction is well adapted for the use in public areas. The twin-USB port offers you double security and long-term reliability for a trouble-free operation. Due to to the Windows XP embedded operating system with Microsoft Enhanced Write Filter Technology the book2net kiosk offers maximum security against computer viruses and long-term-support by Microsoft. 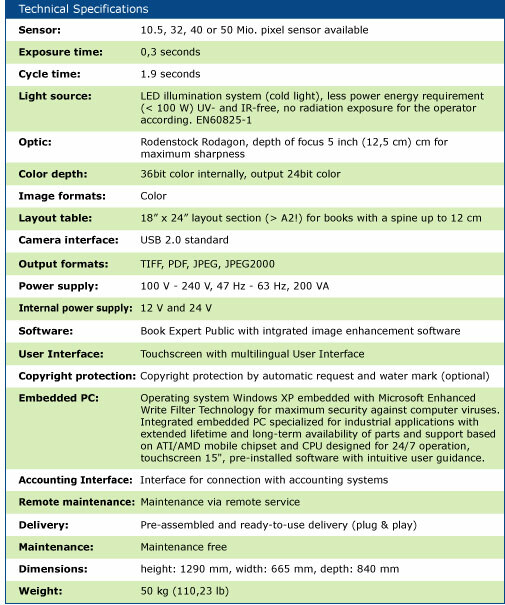 The PC is equiped with industrial standard components with extended lifetime and long-term availability. The unique twin touch technology of the book2net kiosk enables even unskilled walk-up operators to achieve a high-quality scan with only two touches. The intuitive touch screen user interface offers the possibilty to switch between 7 languages at any stage of operation. Beyond the added value the new technology of the book2net kiosk offers to you it also gives you the opportunity to reduce your costs and raise your revenue. 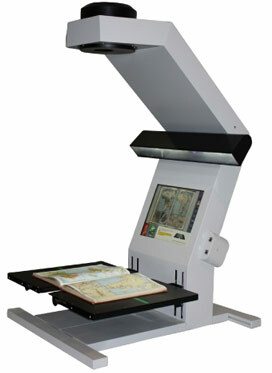 Please click on the links below to see what staff and customers are saying about the book scanner.